Cats and dogs have been living alongside humans for such a long time that we sometimes forget that they used to be predators in their own right. Even though dogs have been living with us for at least 40,000 years and cats for about 10,000, they have a different anatomy and physiology from us, so we should feed them accordingly. And more important, even though both species started off as predators, their anatomy is not the same, and each species has particular needs that have to be addressed. 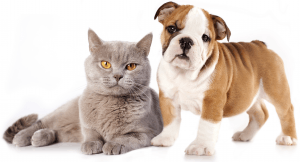 One of the things we should be aware is that dogs and cats are both carnivores. This is easily noticeable if you take a look at their skulls and compare it with ours. As omnivores, our teeth are made to handle all sorts of foods. Our canines are pointy so we can grab the meat off bones and chew it. But our molars are flat so we can grind plant matter. Now, if you take a look at a cat’s skull, you will instantly notice that its teeth are not similar to ours. First off, cats have long and sharp canines. Besides allowing them to hunt, the long canines give cats the opportunity to take small mouthfuls of meat. Cats also have molars, but unlike us, theirs are pointy, allowing them to crush and chew meat. If you take a look at a dog’s skull, you will notice that it also has long canines and sharp molars. But unlike the cat’s, the dog’s are not so long and sharp. You might be wondering why this is. Well, it’s mainly because dogs and cats have different hunting and eating habits. When you take a look at a cat when it’s eating, you will notice that it will take small mouthfuls of food and chew them thoroughly before swallowing. Dogs, on the other hand, rush into their meals. They take large mouthfuls which they chew only sparingly before swallowing. And that’s not all. 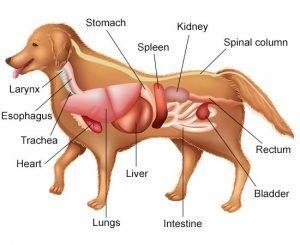 There are other differences between our anatomy and that of our pets we should take into consideration. Humans have incredibly long gastro-intestinal tracts. On average, humans have a digestion time of up to 53 hours. By comparison, dogs have a digestion time of up to 30 hours, whereas cats will completely digest and eliminate their food in up to 24 hours. But the digestive time alone is not a very relevant indicator unless we take into account the type of food we’re all eating. Cats and dogs are biologically adapted to break down meat. Cats chew the meat properly before swallowing, facilitating its access to the stomach. Because dogs chew their meat fast and not very thorough, their bodies have adapted to produce a lot of saliva when they’re eating. You might have noticed that your pooch drools when it’s chewing. Well, that was nature’s fix to allow dogs to swallow large chunks of meat without chewing them properly and without choking. Both species use protein digestive enzymes to break down the meat quickly, but they partially or completely lack the enzymes required to digest some foods we’re well adapted to. As you could see, cats have a difficult time processing a lot of foods that we consume. 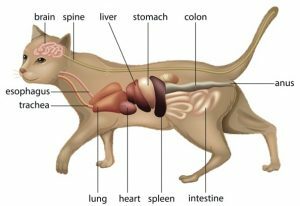 Everything in the cat’s anatomy and physiology indicates that it’s a way better carnivore than the dog and that its diet should consist mostly of meat. 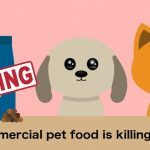 Moreover, carbs can be dangerous for cats, and given that most processed foods contain a lot of carbs, they can also be dangerous for our furry companions. While dogs are better adapted to break down the nutrients they get from eating plants, they are far from being the omnivores that we are. Some people might argue that dogs should eat a protein-based diet because wolves, their ancestors, do not eat plants in the wild, but that stance is not backed by science. It’s true that you won’t find any wolves up and about gathering herbs, but we should not forget that their prey consists of herbivores. Wolves are foragers, and they do not leave anything untouched. So when wolves hunt, they will eat the herbivores’ digestive systems, meaning that they will indirectly consume plant matter as well (3). Moreover, being the foragers that they are, wolves will eat cherries, apples, grapes, figs, plums, and even melons when they find them. While some researchers believe that wolves consume fruit and even grass to prevent parasites, others believe they consume them for the high vitamin content. But while the wolves can consume plant matter, we should not confuse these fruit and grasses with the starchy carbs commonly found in dog food. In the warm season, up to 20% of the wolves’ diet consists of plants, but this plant matter is not rice, wheat, or corn. But commercial dog food contains at least 30% carbs, and some brands can even contain up to 60%. As you can imagine, cats prefer eating foods prepared with chicken, rabbit, turkey, or seafood. You might have noticed that they’re not crazy about pork or beef. That’s because evolutionary they wouldn’t be able to hunt foals or pigs. Cats are solitary hunters, and while they might occasionally take a risk and hunt something that’s close to their size or slightly larger, not even the hungriest cat would risk attacking such a large prey. You might think that feeding your cat raw food is beneficial, but studies have confirmed that it’s actually not. While it’s true that wild cats do not eat cooked meat, it’s also true that they are infested with various parasites and bacteria commonly found in meat. The best solution would be to cook human-grade food for your cat. There are plenty tasty recipes to choose from, and most of them can be prepared with ease. Dogs are notorious for eating anything you put in front of them, but that doesn’t mean you should feed them everything. Their diet should be meat-based, but you should also make certain to incorporate some veggies and fruit into it. 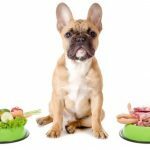 You might think that feeding your dog raw meat is a good solution, but the truth is, eating raw meat will most likely lead to several digestive problems. You might argue that wolves eat their meat raw without any problems, and they do. But they also consume the prey’s hair, wool, hoofs, and sinew alongside the meat. While these ingredients might not seem appetizing to us and we wouldn’t feed them to our pets, they contain a lot of vitamins and minerals both wolves and dogs need to thrive. Since feeding dry kibble is almost as bad as feeding our pets hair or wool, the best solution for our dogs would be to feed them cooked human-grade food. There are multiple recipes specially developed with your dog in mind which are easy to prepare. Give them a try, your friend will love you for it.